Music Is Everywhere: John Cage At 100 Cage's most lasting influence may be in his ideas — about the boundaries between noise and music and the artistic freedom that comes from breaking the rules. John Cage during his 1966 concert at the opening of the National Arts Foundation in Washington, D.C.
OK, let's get the elephant out of the room right away. John Cage's most famous, or infamous, work is "4'33"," in which a musician walks onstage and sits at the piano for 4 minutes and 33 seconds. The "music" in this seemingly silent composition is all of the sound that occurs in the concert hall — the coughs, the rustling, the noise coming in from outside. In a 1963 interview with public radio station KPFK, Cage described a revelation he'd had 15 years earlier, when he visited an anechoic chamber at Harvard University: a room that's supposed to be completely silent. "In that room, I heard two sounds, whereas I expected to hear nothing," Cage said. "So when I got out of the room, I asked the engineer what those two sounds were. One was high and one was low. And he said, 'Well, the high one was your nervous system in operation. And the low one was the circulation of your blood.' Therefore, even if I remain silent, I was, under certain circumstances, musical." Kay Larson is the author of a new book called Where the Heart Beats: John Cage, Zen Buddhism, and the Inner Life of Artists. She says Cage's ideas had a huge influence, especially on the visual arts. "The point is to look around you and see what's present in the world, and what that music of the world sounds like, and then make music out of that," Larson says. "He changed the entire culture of the arts in America and Europe." Larson says Cage spread his ideas about art and life at an abstract expressionist hangout in Greenwich Village called The Club, as well as in the class Cage taught at the New School. The young artists listening included Jasper Johns, Robert Rauschenberg and Yoko Ono. "Because of his friendship with these artists, there was this tremendous outpouring in the art community, through the early '60s, of brand new forms," Larson says. "Happenings, pop art, minimalism, performance art, installation art, process art — I could go on and on. And if you look at who created those forms, they all had come in contact with John Cage at some point in the 1950s." Alex Ross, music critic for The New Yorker, says Cage had an equally momentous impact on musicians. "What so many people said at different points was that Cage allowed them to think differently, just by clearing away all the rules," Ross says. "For example, the musical movement known as minimalism was something that was very much a departure from Cage's practice — something that Cage himself actually didn't like. But I think it's something that couldn't have happened without Cage, without everything having been cleared away." Cage made up his own rules in his art, as well as in his life. He was valedictorian of his Los Angeles High School class, but he quickly dropped out of college because of what he saw as a lack of original thinking. When he was 22, he married a Russian artist from Alaska, but he preferred the company of men. He lived with choreographer Merce Cunningham for the last 45 years of his life. In the 1930s, Cage studied with the 12-tone modernist Arnold Schoenberg, but he never composed in Schoenberg's style. When Cage did begin writing music, he distinguished himself with pieces for percussion instruments alone. "His intricacy of rhythm is really astounding," Ross says, "and the quality that separates him from a great many other composers, even some of the greatest in the classical canon." Ross says Cage was constantly coming up with new ways to make music. He was one of the first to use a "prepared piano." "This fabulous instrument which really turns a piano into a percussion instrument by inserting objects between the strings," Ross says. "Which creates this fabulous sound." 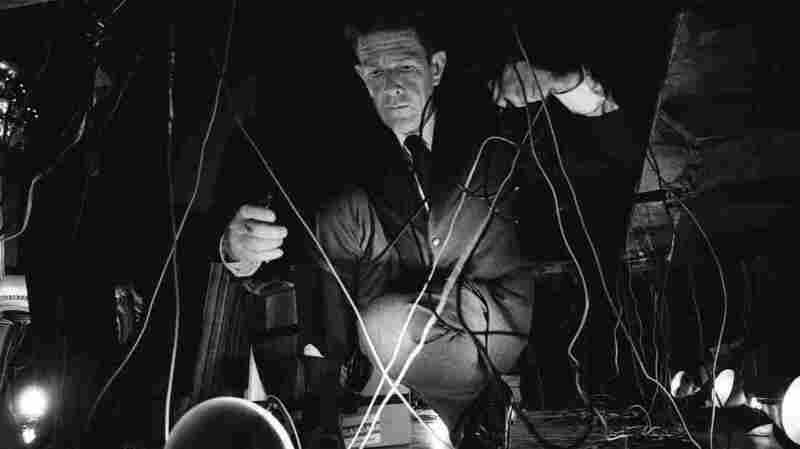 In the 1940s, Cage pioneered electronic music, creating works out of randomly assembled snippets of audiotape. But perhaps Cage's greatest invention was his approach to music and art. After two years studying Zen Buddhism, Cage came up with the idea of using chance to compose his music. He used the I Ching and literally rolled the dice to determine which elements went where, freeing the music from the composer's preconceptions. Cage said he wanted to see each act as new, as a fresh experience — even something you do every day. "Gradually, and through a study of Oriental philosophy and through the use of chance operations," Cage said, "I have found ways, I think, of letting sounds move from their own centers rather than centers in my mind." Cage was a self-taught expert on mushrooms. Early in his career, he made a living gathering mushrooms in the country and selling them to gourmet restaurants like the Four Seasons. In 1982, Cage said that mushrooms reminded him of the ephemeral nature of life. "That's one of the beautiful things about hunting mushrooms," he said. "They grow up and they're fresh at just a particular moment, and our lives are actually characterized by moments." John Cage taught that music is everywhere in the ordinary moments of life. We just have to learn to hear it.